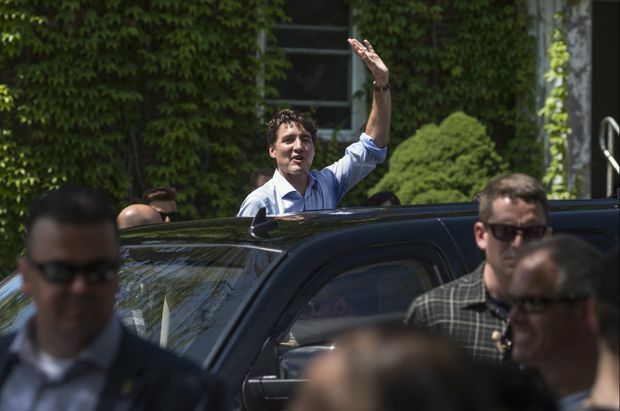 Prime Minister Justin Trudeau waves to supporters at St. Francis Xavier University in Antigonish, N.S. on July 17, 2018. Prime Minister Justin Trudeau is slated to shuffle his cabinet on Wednesday in a move designed to diversify Canadian trade away from the United States, handle changing political landscapes in the provinces and prepare for next year’s election. The shuffle is expected to increase the size of the cabinet from the current 30 members without moving core senior ministers such as Finance Minister Bill Morneau and Foreign Affairs Minister Chrystia Freeland, who is preoccupied with North American free-trade agreement negotiations and the potential trade war with the United States. A senior Liberal source, who was not authorized to speak on the record, said the shuffle will include a plan to reorient Canada’s trade with an emphasis on encouraging Canadian businesses to look for export markets in Asia, Latin America and elsewhere. The source would provide no further details, but said the U.S. government’s protectionist policies leave Canada no option but to diversify its trade. Sources say the Prime Minister is well aware that the federal Liberals must counter Ontario’s new Conservative government and prepare for the likelihood that Alberta’s United Conservative Party and the nationalist Coalition Avenir Quebec will win provincial elections next year. The Trudeau government has already battled with British Columbia’s NDP government over the Trans Mountain pipeline expansion. Insiders say Fisheries Minister Dominic LeBlanc will become intergovernmental affairs minister and work with Mr. Trudeau on hot provincial files such as a dispute with Ontario, Prince Edward Island, New Brunswick and Saskatchewan over the carbon tax, as well as the migrant crisis. The bilingual Mr. LeBlanc, who recently recovered from chronic lymphocytic leukemia, is a savvy political operator whom the Prime Minister relies on for his instincts, one source said. One government official said it would be perilous for the federal Conservatives and Ontario government to try to exploit the migrant crisis for partisan gain. The government is expected to create a new seniors’ ministry and a cabinet post to handle the implementation of legalized cannabis – a job that could be handed to former Toronto police chief Bill Blair. As Parliamentary Justice Secretary, Mr. Blair played a key role in devising the new cannabis law that takes effect in October. Science Minister Kirsty Duncan, who has also juggled the sports ministry and impressed the Prime Minister by ensuring that science funding was made available to more women and minorities, is expected to be promoted. Mr. Trudeau is also expected to free up Innovation Minister Navdeep Bains to boost the Liberal Party’s presence in ridings with large Indo-Canadian populations and counter the potential influence of new NDP Leader Jagmeet Singh in Vancouver and the Greater Toronto Area. Mr. Bains, who is in charge of Canada’s innovation and high-tech strategy, is expected to share responsibility for regional development with another minister. Liberal insiders say it is very likely that Markham, Ont., MP Mary Ng, a former Trudeau adviser, will become small business and internal trade minister, and B.C. MP Jonathan Wilkinson will take over as fisheries minister. Procurement and Public Services Minister Carla Qualtrough was asked to return on Wednesday from an international air show in London and is expected to be involved in the shuffle, two Liberal sources said. And sources suggest Heritage Minister Mélanie Joly, who has been criticized for weak performance in the cultural portfolio, could be moved to tourism, official languages and La Francophonie. One Liberal insider said Natural Resources Minister Jim Carr may also be moved out of his portfolio. The shuffle will take place before Mr. Trudeau goes on holidays for several weeks. The government is planning a cabinet retreat in Saskatoon in late August and a September caucus meeting in Nanaimo, B.C., before the House of Commons resumes sitting.